Make this mini pear pies recipe that appeared as the technical challenge in the Pies and Tarts episode of The Great British Baking Show. For the rough puff pastry, measure the flour into a bowl and grate the butter and lard into the flour. Use a knife to coat the butter and lard in the flour. Add 120-150ml (4-5fl oz) cold water and mix until it comes together to form a firm dough. Roll out the pastry on a floured work surface to a rectangle. Fold the top third down and then fold the bottom third up and over. Turn it 90 degrees (a quarter turn) and repeat the rolling and folding. Set aside, covered, in the fridge for 20 minutes. Repeat the rolling, folding and chilling twice more so you have a total of four folds and turns. Set aside, wrapped in cling film, in the fridge until ready to use. Meanwhile, for the poached pears, peel the pears, keeping the stems intact. Tip the caster sugar into a large saucepan with 400ml (14fl oz) water, the white wine, cinnamon and orange zest and slowly bring to the boil, stirring until the sugar is dissolved. Boil for three minutes. Add the pears to the pan. Bring back to the boil, reduce the heat to a simmer and cook for 15 minutes. Reserving the syrup, remove the pears from the pan with a slotted spoon and set aside to cool on kitchen paper. Using a melon baller or small teaspoon remove the core from the pears. Return the syrup to the heat and boil rapidly for 10-15 minutes until the volume of the liquid is reduced by half and the syrup is thick. Remove from the heat and set aside to cool. When the fruit and syrup are cool, roll out the chilled pastry to a rectangle measuring 60x20cm (23½x8 in) and a thickness of no more than 5mm/¼in. Using a sharp knife and a ruler cut the pastry into long strips 8mm (⅓ in) wide. You will need about 18-20 strips. 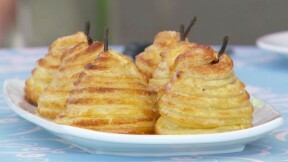 Brush the pears with the cooled sugar syrup and starting from the bottom, wrap the pastry strips around the pears. When you come to the end of the pastry strip, brush the end lightly with syrup and press to adhere to the next pastry strip. Continue wrapping until you reach the top of the pear. (Three strips should cover each pear). Tuck the end of the last pastry piece behind the previous dough spiral. Cut out six leaf shapes from the remaining pastry. Draw veins on the leaves with a sharp knife and stick one leaf below the stem of each pastry pear, with a little sugar syrup. Preheat the oven to 200C/180C(Fan)/400F/Gas 6. Place the pastry covered pears on a baking tray. Brush the pastry with beaten egg and sprinkle with the granulated sugar. Bake for 25-30 minutes. Remove from the oven and leave to cool for 10-15 minutes then serve with a drizzle of the reduced sugar syrup.